So today was my first real battery life test of my iPhone 8 as it's the first day I had to go to work since I got it. I'm happy to report that battery life for me has been exceptional. It was off charger for 10 hours and when I got home from work I was still at 72%. I was doing a moderate amount of texting, some browsing and quite a bit of camera use. I also have fitness tracking apps constantly running in the background. I was not using WiFi at all. This is very good battery life by my standards, in fact it stayed over 90% even three hours into my shift. This beats out my previous champs which were my Google Pixel and my Lumia 1020. With my Pixel I'd be at around 55% at the end of the day with similar usage. How has your battery life been? It must’ve been the A11 Bionic. Battery life is great, but not as great as my iPhone 7 Plus. As long as I can go from around 7 AM when I’m walking out the door to bed time, that’s all I care about. I’m in an office setting all day so if I were experiencing bad battery life, I have a wireless charger at my desk. Sadly I don’t think you can draw any conclusions from this because when you put a new battery in an iPhone, you get great battery life for a while at least. I replaced the battery on my iPhone 6 after 2 years and the difference was ridiculous. My iPhone 8 currently has great battery life but it’s only in line with what I’d expect from a new phone. That’s very true, lithium ion batteries tend to lose their charge overtime. Yep. iPhone batteries are designed to retain 80% of original capacity for 500 full charge cycles. After that you’re on borrowed time. But battery life on these new phones are amazing. My red iPhone 7 Plus was only 3 months old. So not many charges on that. Battery didn’t have many full charges. 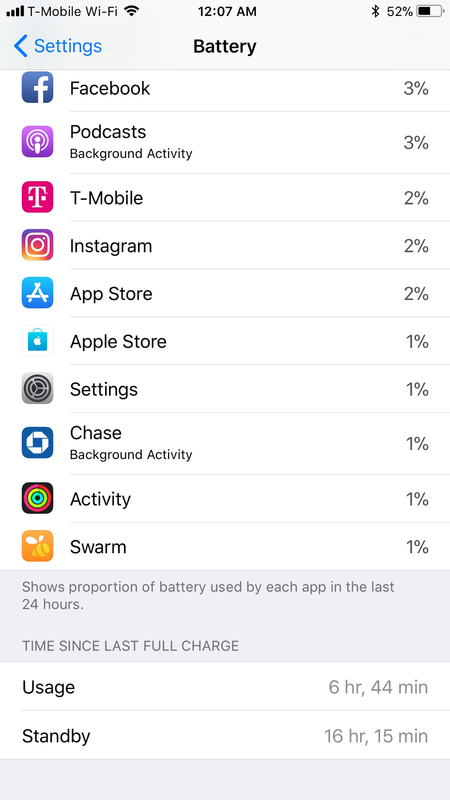 My 8 plus I’d say is getting about 30% more battery life. And I may being conservative on that. Maybe closer to 40%. It’s fair to say A11 Bionic which Apple said that this chip is much more power efficient is correct. I’m completely amazed about this battery life. Yeah. Here is my battery stats from a full day yesterday. I thought it was 750 full cycles? Apple mentioned it to be 500 cycles. 750/1000 for some of the MacBook models. That’s funny because I went to Apple to get my iPhone diagnosed and get a new battery. My capacity was 90% at 586 full charge cycles. I asked the tech about 500 cycles and they said the new Li-Poly batteries are 750. So I said “ok” and went and bought a coffee from a local shop. Hmm.. you can start a Live Chat with Apple Support, and see whether it’s 500 or 750. Can’t get more live than in person . It’s all good. 509 or 750 my 6sPlus is still rocking. I can draw one conclusion for sure: It beat my LG G6 and Google Pixel when they were of comparatively new status. The LG G6 has to power a much larger screen, however the Pixel isn't much larger yet has a 2770 mAh battery compared to the iPhone 8's at 1821 mAh. As much as I love the Pixel the iPhone has it beat there. By full charge cycles do they mean from near 0% to 100%? Or just any time it's charged? I rarely keep phones for longer than a year anyway, so I doubt I'll wear out the battery significantly. I have noticed improved battery life compared to my iPhone 7 by about 20%. last year with the 7 it had great battery life for a few months then it went down the drain. It is awful on IOS11. Just expect it to drop in a few months. A charge cycle would be the equivalent of 0% to 100%. In other words, charging from 50% to 100% would be considered half a cycle. Well in my case I doubt I'd ever come close to wearing the battery out before I get a new phone. I'm not a heavy user and my phone rarely gets below 50% before I can put it on a chargers. Yeah, you’ll only have to worry about your battery if you’re going to use your iPhone for more than 2 years. By then, you can simply bring it to Apple and pay for a replacement battery. When connected to my Apple Watch I'm getting similar battery life to my S8+ but not as good as my 7 Plus. My last non-Plus iPhone was the 6. The 8 has much better battery life than the 6 did even when it was new. iPhone security analytics and possible malware? ?